Our last article before the summer break: European import dependency and power sector intermittency are placing increasing demands on the flexibility of gas supply infrastructure. These trends primarily drive a requirement for greater deliverability (as opposed to greater seasonal flexibility). Yet the market price signal for deliverability, spot hub price volatility, remains subdued. The article below is our last before the summer break. We will be back with more in late August. These trends primarily drive a requirement for greater gas deliverability (as opposed to greater seasonal flexibility). Yet the market price signal for deliverability, spot hub price volatility, has remained subdued over the last five years. In this article we look at the evolution of historical volatility. We investigate the recovery in volatility that started last summer and has since fizzled out. And we explore some of the factors driving ongoing weakness in hub price volatility & the implications for investment in deliverability. 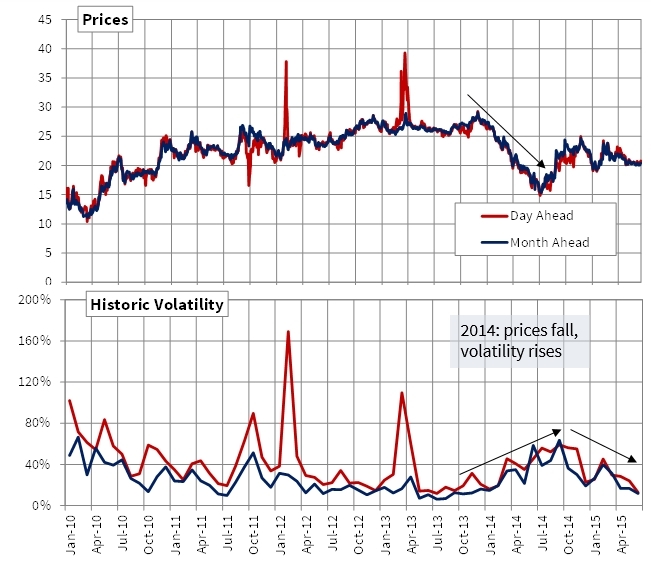 There were several sharp spikes in day-ahead price volatility across 2011-13 relating to specific supply shocks (e.g. the Norwegian field and IUK outages in 2013). But the effects of these were short lived and had little impact on underlying volatility weakness, as illustrated in Chart 1. 2014 ushered in the start of what looked to be a shift in the underlying level of volatility. Higher volatility is typically associated with higher prices in energy markets. But the first half of 2014 saw hub prices fall (weak demand, higher LNG imports) and volatility rise, particularly over the summer which is typically a relatively weak time for volatility. As hub prices fell they disconnected from oil-indexed contract prices, reducing contract take and the use of swing flexibility. Towards the end of 2014 and into 2015, volatility levels sank back towards the depressed levels of the last few years (sub 40% on an annualised basis). Over this period hub prices re-converged with oil-indexed contract prices, due in part to a hub price recovery and in part to falling oil prices. The volatility recovery of summer 2014 proved to be a short lived phenomenon. What does 2014 tell us about the future? The factors that drove this rise in volatility are interesting as they may apply again in periods going forward. Warm weather at the start of 2014 caused a slump in demand as we explored in detail last week. As the summer approached gas hubs were swamped with heavy storage withdrawals and an increase in LNG imports due to weak Asian spot prices. This knocked the market out of equilibrium and drove hub prices well below oil-indexed contract prices. Prompt volatility rose as a result. 2014 gas demand was 52bcm down on 2013, given some of the warmest weather in recorded history. In other words it represented a low demand outlier event. But the other factor contributing to oversupply, an increase in LNG imports, is something that is set to happen in much higher volume over the next 3 years as new liquefaction capacity comes online. We have outlined in a number of previous articles the risk of higher LNG import volumes driving the European gas market past the tipping point of available pipeline contract flexibility to absorb them. In an oversupplied market such as this, flexible LNG flows will play an important role in setting marginal hub prices. They will typically do so at price levels below oil-indexed contract prices under similar (or more severe) conditions as those seen in the summer of 2014. It is also likely that lower gas prices will see greater swing demand from CCGT power plants as they come back into merit. In addition LNG imports are likely to ebb and flow in response to short term regional price signals in the LNG spot market. So while conditions of oversupply have been associated with depressed volatility over the last few years, this will not necessarily be the case going forward. A transition to a more serious state of oversupply may see both LNG imports and the power sector influencing marginal hub prices (as they disconnect from oil-indexed contract prices). And this may drive an increase in prompt price volatility. Europe also faces the question of how new flexible gas supply infrastructure will be commissioned given the current absence of a market price signal in a weak volatility environment. The same logic applies to the approval of renewal capex spend on ageing existing infrastructure (e.g. Centrica’s Rough facility in the UK), which may have a higher cost structure than deliverability sourced from investment in new flexible assets. Virtually no new deliverability is being added across Europe in the current market environment. In fact the market is losing flexibility from existing infrastructure, e.g. Groningen field cut & the reduction of UK storage flexibility (Rough & Hornsea). That is not to say there is anything wrong with the European gas market. Just that there is a disconnect between current price signals and the investment in deliverability required into next decade. In that context, if you can buy or invest in high deliverability flexible assets that are priced based on current volatility conditions, you may stand to make healthy returns into next decade.